Immanuel Southern Baptist Church in Wagoner, OK, refuses to apologize for a message on their sign which offends every major religion in the world. 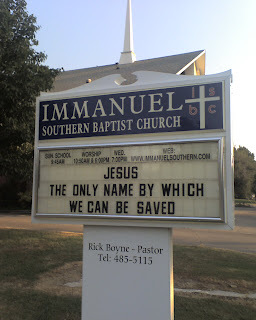 The sign reads, "JESUS - THE ONLY NAME BY WHICH WE CAN BE SAVED"
The message is offensive to major world religions because it implies that their belief system will not get them to God. "It is a myth that all religions lead to God," said, Rick Boyne, Pastor. "The Bible says that the only way to God is through Jesus. We're not going to apologize for what the Bible says. The message offends Jews because they do not recognize Jesus as the Messiah. The message offends Muslims because they do not recognize Jesus as the Son of God. The message offends Buddhists because it denies 'enlightenment' and synchronicity. The message offends Hindus because it denies Karma and their host of false gods. The message offends atheists (yes, it is a belief system) because it denies their denial of God and the need for salvation. The message offends unbelievers of any religion because it confronts their need for salvation. The message even offends many Christians because it denies that salvation is by works, or "being good." The church sign is located at 611 N. Gertrude Ave, Wagoner, OK 74467. The pastor can be reached for comment at rick (at) immanuelsouthern (dot) com. Nothing to apologize for rick. Actually, it implies that. From the message, the reader may infer it. Oh yeah. What Bill said. That's why editors are so important. If you don't believe me, just ask Steve Heartsill! It is what sets your church apart from the others. Your belief. You have every right to exercise that belief and the freedom of speech to proclaim it from a mountain top. You are RIGHT on! Nothing to apologize for, whatsoever! Out of curiosity, has anyone asked you to apologize? Anonymous #3 - not yet. BUT WE WON'T DO IT IF WE'RE ASKED TO!